Sight is generally the primary sense for identifying plants and wildlife in the natural world, but sometimes other senses assert themselves. We went for a long walk out along the Grantham Canal and across the fields today, walking through a true British summer including blazing sunshine, rain showers and thunder storms. As we were walking along the canal, an arresting scent caused us to stop and investigate further. 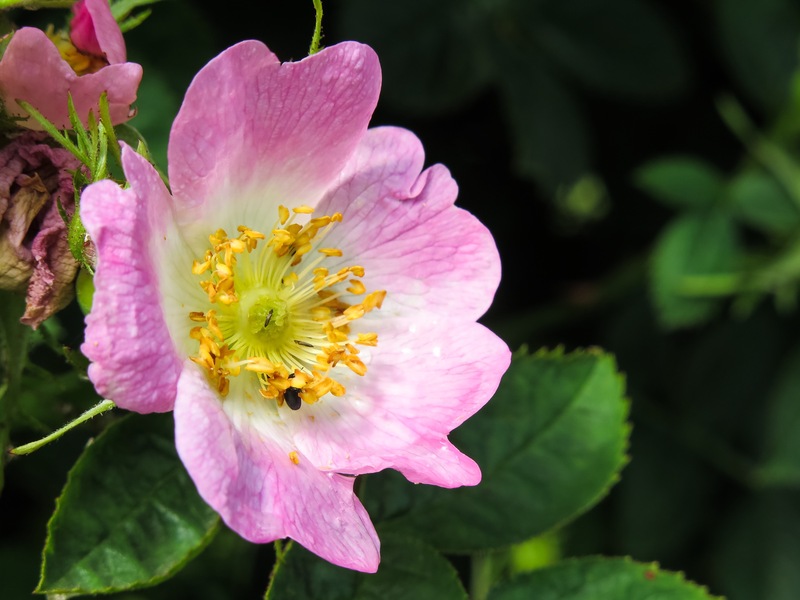 Interspersed with the dogrose which entwines the hawthorn was sweet briar – another rose species whose incredible scent filled the towpath air beside it. Further investigation of the leaves identified the distinctive apple scent when crushed – another way in which the sense of smell is diagnostic. When you’re out and about, keep all your senses keen to make sure you don’t miss a thing – whether this is hearing the birdsong in the trees, seeing butterflies bouncing along the hedgerow, tastingwild garlic or smelling the wildflowers.